Lots of crochet happening but not so much finishing! Anyone else out there a chronic starter who struggles with the follow through? 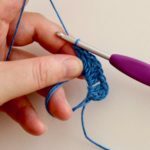 It’s not that I don’t want to finish things – I do! 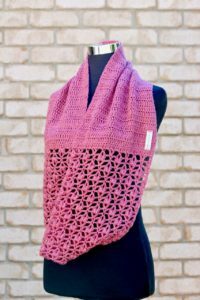 – I just get so distracted by new soft squishy projects or I have an amazing idea that has to be swatched and tested right away! I have so many swatches on my desk right now and many others that have been frogged in disgrace, plus I’ve been working on getting some ready made items to list in my Etsy shop. All of this has led to a very productive month or so but not much on the blog. Sorry! So to remedy that a bit I’m going to share what I’ve been up to and then I’m off to try finishing something. At the beginning of the June I posted a tutorial on the Double Magic Circle. This was actually fun for me as it appealed to the teacher in me. I’m hoping to do some more tutorials and would love to hear any suggestions for subject material. 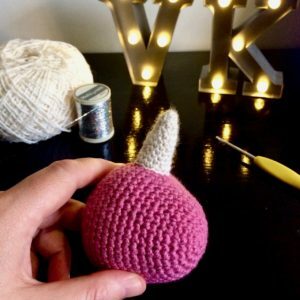 Following that I worked on the unicorn lovies I’m making for my best friend’s twin girls. I made her son a cat lovey (named Kitty) and I’m making these to match. They all have little chain loop knots in each corner of the blankets to represent feet/paws, which was inspired by my son’s ‘Puppy’ as he loved the little knotted feet and would chew on them when he was teething or roll the knots around in his cute little hands. I have made the second blanket and head and I’m working on the little details like horns and ears now. I’m hoping that I can get them completed some time in the next few weeks but here’s some pics of them in progress. On the pattern side of things I have been working on the written pattern for my newest scarf pattern. This is an infinity scarf I made for another friend and it consists of a solid and a lace section so it can be both pretty and warm. 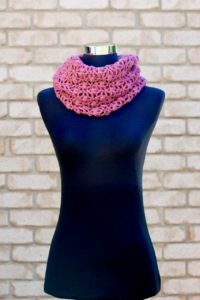 I have also made a cowl version of the pattern and a matching ear warmer, both of which are included in the pattern. It takes a lot longer than I thought to get a full pattern written up as there are so many elements involved. I have to write it up and format it so it’s easy to read, take the tutorial photos, put them in and annotate them, block the finished items and take lots of pretty photos. Then I have to make a chart (if needed), proofread, edit and export to pdf! Phew! 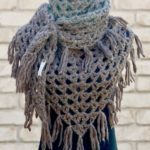 But I have finished this one and one of my wonderful Instagram followers provided me with a name that’s as pretty as the scarf. Meet the Path of Petals Set! Thanks Cristiane @crisprata68. Now available through Etsy and Ravelry. To celebrate the release of my 8th pattern, the Path of Petals Set, until the end of the July 2017 you can get 8% off all my patterns through Ravelry with the code PoP8% . Next, I have begun ‘translating’ my patterns into UK terminology. 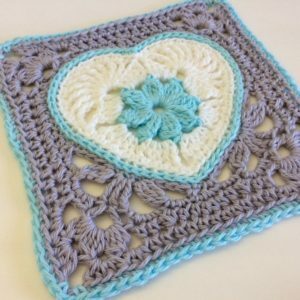 I learned to crochet online and most of the resources I used were in US terms so that is my first crochet language but here in Australia a lot of people use UK terms (like my mum for example) and so I feel it’s important to have my patterns in both. 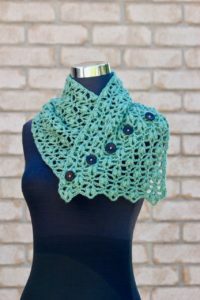 So far I have added the UK version of the Almost a Granny Triangle Scarf to both Etsy and Ravelry and will continue to add the others as I get a chance to do them. If you’d like to stay updated on this I am most active on my Instagram account and will be announcing each one on there. 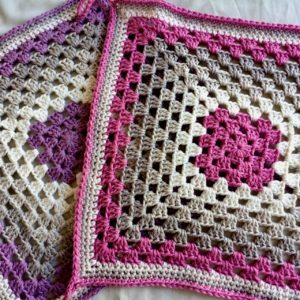 I have also continued working on the squares for my Heart In Bloom blanket and I can see the light at the end of the tunnel. I have 1 square to go – the tutorial photo square – and I am just waiting for the right combination of free time and a well lit day to do this one. Then I can join the squares and start serious work on the pattern. 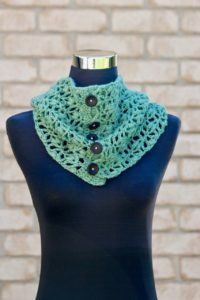 I will be looking for testers for this patterns so if you are interested let me know. 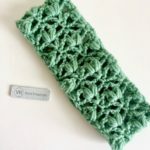 Now most of my crochet time over the last month or so has been spent on making some ready made items for my Etsy shop. I have had a desire to just crochet and watch Netflix in between everything else and have been working on a couple of different versions of some of my patterns which I will be listing for sale very soon. 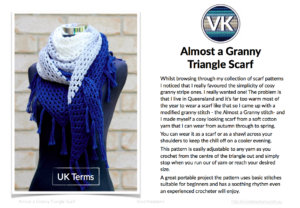 There are 2 Almost a Granny Triangle scarves. One in a bulky Alpaca/Wool/Acrylic blend yarn in a lovely dusty chocolate brown and the other just like the one I made for my friend Maggie in my favourite Bendigo Woollen Mills cotton but this time in Snow, Glacier and Light Teal. Both of these scarves are great simple cosy scarves in their own way and I hope they both find wonderful new homes. 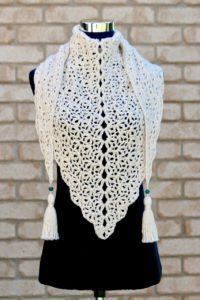 I have also just made a bulky version of my Faded Love Shawl using 2 strands of 8ply (DK) BWM cotton in parchment. This is sized as a scarf and I am totally in love with how it turned out! I see more of these in my future. I added some beaded tassels using the Mijo Crochet tutorial and they are the perfect finishing touch. Honestly I am in love with all the tasseled scarves I’ve been seeing lately. I think the tassels really added something special. So if you add these 3 to the items I already have to list that makes 6 ready made items that will be debuting in my shop over the next month. Last but not least is not something I have made but something I have purchased that I’m quite excited about – my garment tags! 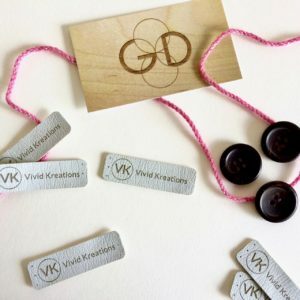 I found a wonderful couple who run the shop Grain Deep on Etsy and ordered a set of 50 custom ultra leather tags in the colour Frost. Isac and Sonya were lovely to work with and they made the tags in a custom size with my logo and business name on them. The even used my font too! Check out how awesome they look! Grain Deep also make some gorgeous wood products too, from tags to clocks to coasters, and I think I may need to order some of these as soon as I can afford it! Have a look at their fantastic selection here. ← Tutorial: the Double Magic Circle.